Pimpri Chinchwad Education Trust (www.pccoepune.com), Pune Published Job Notification for Assistant Professor – Professor & More Posts. Candidates who wish to apply must look at Pimpri Chinchwad Education Trust Assistant Professor – Professor & More Recruitment 2018. Eligible candidates can apply Offline before 16-08-2018. Pimpri Chinchwad College of Engineering published Job Advertisement telling to apply Pimpri Chinchwad Education Trust Recruitment 2018. This new advertisement is about the vacancies of Assistant Professor – Professor & More. Candidates are advised to read official notification carefully before applying. 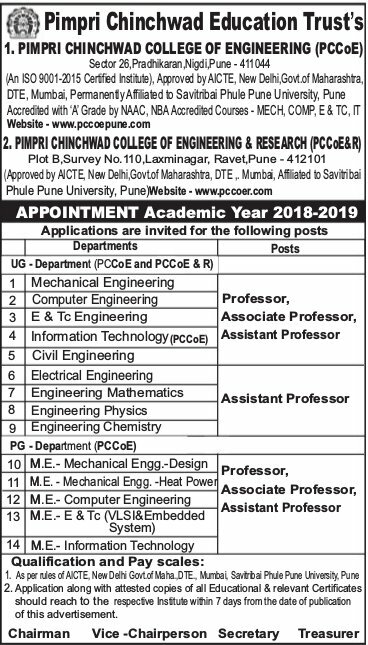 Interested & Eligible candidates can send their application along with all the necessary documents and testimonials to PCCOE – Pimpri Chinchwad College Of Engineering, Near Akurdi Railway Station Road, Sector-26, Pradhikaran, Nigdi, Pimpri-Chinchwad, Maharashtra 411044. Starting Date, Last Date to Apply Offline at Pimpri Chinchwad College of Engineering which candidates should be remembers as follows.